Bundle Package Includes McKinsey Valuation Fifth Edition and the McKinsey DCF Valuation Model via website download. 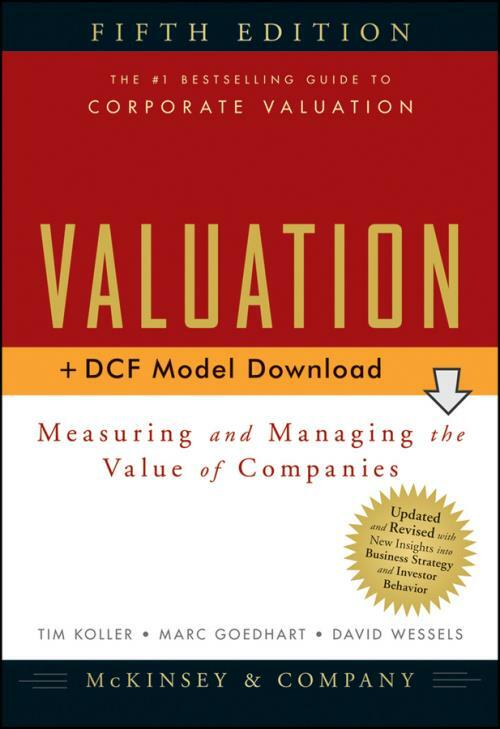 McKinsey's Valuation + DCF Model Download: Measuring and Managing the Value of Companies, Fifth Edition, provides the knowledge executives need to make value-creating decisions and McKinsey’s own proprietary discounted cash flow model to help them apply the techniques in the real world. - PROVEN McKINSEY APPROACH gives strategies for multi-business valuation, corporate restructuring, mergers, acquisitions, and more using the McKinsey discounted cash flow approach. By combining the dynamic flexibility of a DCF Model Download with the depth and breadth of a classic text, this package will help you hone your valuation skills today and improve them for years to come. McKINSEY & COMPANY is a management consulting firm that helps leading corporations and organizations make distinctive, lasting, and substantial improvements in their performance. Over the past seven decades, the firm's primary objective has remained constant: to serve as an organization's most trusted external advisor on critical issues facing senior management. TIM KOLLER is a partner in McKinsey's New York office. Tim has served clients in North America and Europe on corporate strategy and issues concerning capital markets, M&A transactions, and value-based management. He leads the firm's research activities in valuation and capital markets issues. He received his MBA from the University of Chicago. MARC GOEDHART is an associate principal in McKinsey's Amsterdam office. Marc has served clients across Europe on portfolio restructuring, issues concerning capital markets, and M&A transactions. He received a PhD in finance from Erasmus University Rotterdam. DAVID WESSELS is an adjunct professor of finance and director of executive education at the Wharton School of the University of Pennsylvania. Named by BusinessWeek as one of America's top business school instructors, he teaches corporate valuation at the MBA and Executive MBA levels. David received his PhD from the University of California at Los Angeles.